Most all of the B&W pictures that you see on here (and 3Wide’s message board) from the old days, were made in my old darkroom, in my parent’s old home. Back in the day, we actually had to develop and print each picture by hand. It was a long, long process, all in the dark and while breathing fumes. Film had to be handled in total darkness. You had to open the film canister and load the film on a reel, totally blind. You had to feel the film and developer tank parts and put them all together in the dark. Once the film was in the dark, you could turn on the lights and start dumping the chemicals in to start the developing process. After the four different chemicals were done, you had to wash the film for several minutes. You timed every process and tried to control the temperature of the chemicals, keeping them around 68 degrees, which was tough to do on a hot day. All this was done after the races, into the early hours of the morning sometimes. Then, you waited for the film to dry. Next up, you cut the negatives and filed them. Then, you mixed more chemicals for printing. Usually, you had four trays of chemicals for the prints. You made prints by metering or guessing the exposure and then you printed a test print. Rarely was it good enough, so you kept printing more until you nailed it. It took a long time just to make a half dozen quality prints for the racing news. You ran those prints through the chemicals, washed them and dried them all under the dim light of the safelight. We wasted a lot of water back then. My mom had a hair salon in the house, which used a ton of water, so between the both of us, we had a high water bill. My parents didn’t like that part of it. Then, you labeled and rubber stamped each picture and mailed them to the racing paper and hoped that they got there in time for the deadline. Sometimes the pictures wouldn’t make it there on time and all that work (for free, I might add) went down the drain. That sucked. Sometimes those great looking prints that you made, turned out real light or real dark in the paper and that was a bummer. Back then, the newspaper printing quality was hit or miss, it seemed. 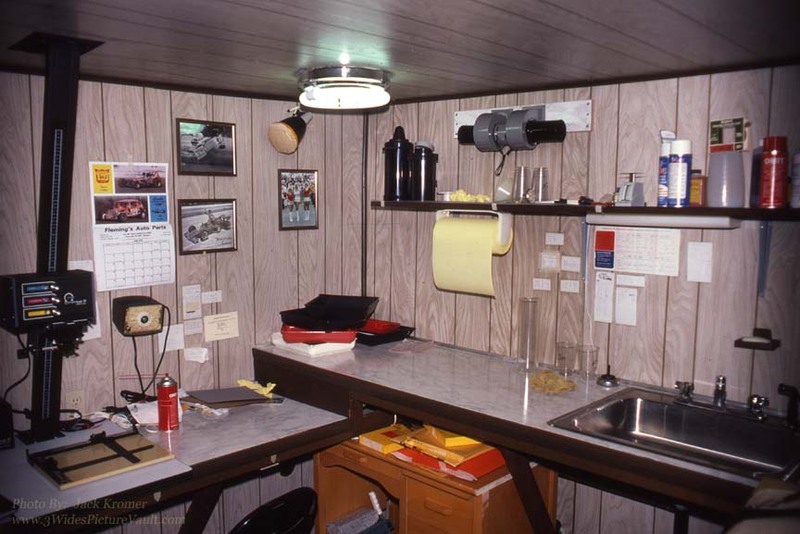 The darkroom pictured here, was that of my second darkroom, which I built in my parent’s house when I was a kid. It was modeled after Mel Stettler’s darkroom setup, but smaller. Every time I moved to another house, I had to build another darkroom. That was a pain. I built four through the years. After you built a darkroom, you had to light proof it. You had to turn all the lights on outside of it and sit inside of the darkroom in complete darkness for a while, until your eyes adjusted, then you could see light leaking in all over the place. One would think that nailing all that paneling to the two by threes would be fairly light tight. Nope. Then, you start caulking everywhere you saw light. Then, repeat the process. Turnoff the lights inside and sit in there until you saw light leaks. Light was your enemy now. Ironic, because you need and want light to make a picture, now you hate it. Light would even leak through the electrical boxes, even with plate covers on it. So, you caulked the crap out of the electrical boxes. Finally, when it was totally dark inside, it was now safe for loading and developing film. Judging by the date on this photo- July 1978, I must have been bored while I was recovering from my Flemington accident, so I took pictures around the house. Back in late 1977, I bought a color head for my enlarger (shown below) and tried to make color prints. That never really caught on with me, so I just printed my B&W’s through the color enlarger. I see a fluorescent light in my darkroom here and that is a no-no. When you turn off those lights, they still give off light and that could ruin your film. I found that fluorescent light in the basement, from our old kitchen, so it was a free light. Cheap. Tough times. Later, I fixed that and used a regular light bulb. I see masking tape over my yellow safelight. It must have been too bright and that would fog the paper and show up on your print. I see that I added homemade black tube extensions that I think were from Pringle’s cans, to the exhaust fan, to keep light out. I see lots of charts for the chemicals, mostly time and temperature stuff. I see an autographed Mario Andretti picture here on the darkroom wall and one of Andy Belmont cashing at Nazareth. There’s my favorite shot of the time of Linda Vaughn and the Hurst ladies, hanging there, too. I shot that at Pocono. I see the Fleming’s Auto Parts ad on my calendar there. I’m surprised to see that there. I never noticed it back then. I never knew what Fleming’s was and it didn’t mean anything to me, until recently when I went to my first Pumpkin Run in 2013. Now it means a lot. What a cool place, for sure. I see my old desk from when I was little, there in my darkroom. I recycled that desk and mom’s old diaper drawers that she used on me when I was born and I used them in my darkroom for storage. All those were used stuff lying around, so I made use of those freebies. Those items are still in my last darkroom in the basement of our present home, here. I made custom lightproof air vents for my darkroom while I was in metal shop in high school. I still have those. Recently, my old shop teacher moved back to the area and his face lit up when I told him that I still have those filters, that I made in his class and they still work! That was a different era. It’s so easy now. You just click on your mouse to make a picture while you’re sitting in your brightly lit living room, while you’re watching TV or hanging out with your family. No chemical fumes. Even though we missed a lot back then, because we were locked in that darkroom on a mission, I wouldn’t trade it for anything.